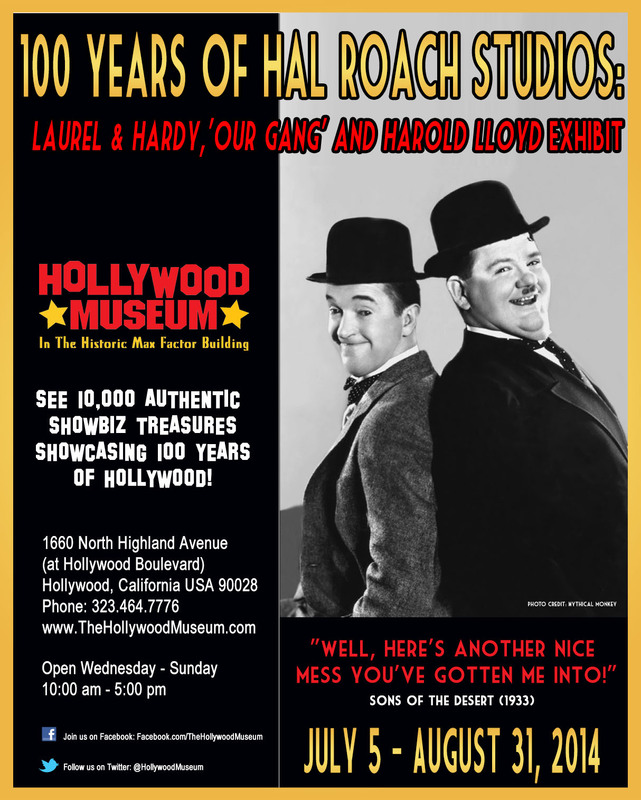 The Hollywood Museum has unveiled its new exhibit, 100 Years of Hal Roach Studios: Laurel & Hardy, ‘Our Gang’ and Harold Lloyd in distinct honor of the Hollywood icon’s centennial, open to the public through August 31st. The fun exhibit contains authentic photos, costumes and props from the rich history of Hal Roach Studios and the legendary talents that emanated from there in the early 1900’s. Hal Roach’s life was colorful, as anything ever portrayed on film. In addition to Laurel and Hardy, Hal Roach Studios brought to fame such actors as Harold Lloyd, the Our Gang tots (better known as The Little Rascals or Hal Roach’s Rascals), bombshell actress Thelma Todd, Zasu Pitts, and Charley Chase. Other performers who graduated from Roach comedies on the path to stardom were such actors as Jean Harlow, Janet Gaynor, Fay Wray, Paulette Goddard, Jean Arthur, and Boris Karloff. Roach’s powerful film of John Steinbeck’s Of Mice and Men was possibly his masterwork and One Million B.C. was notable for his collaboration with D.W. Griffith. John Wayne, Buster Keaton and John Ford were among the many big name stars and directors who worked on Roach television shows. Objects pertaining to Hal Roach include his honorary 1984 Oscar and a Hal Roach Studios camera, while Harold Lloyd items include a makeup case, glasses, and rare film posters and photos. Additional Laurel & Hardy ephemeras consist of film posters, photographs, scripts, sheet music, scrapbooks, personal photos and letters, and Al Hirschfield-designed window cards. The Hollywood Museum in the historic Max Factor Building is located at 1660 N. Highland Ave. at Hollywood and Highland. This entry was posted on Sunday, July 27th, 2014 at 12:42 pm	and is filed under Blog by Manny Pacheco. You can follow any comments to this post through the RSS 2.0 feed. Responses are currently closed, but you can trackback from your own site.